Many people wonder why painting in plein air is so difficult. I consider it the greatest painting challenge. Contrasting plein air painting to studio painting reveals the challenges of painting in the field. In the studio we have plenty of time. We can easily adjust the paint so it will dry slowly. We work from a sketch, a plein air painting, or a photograph. All of which we can prepare and study at our leisure without worry about the passage of time. In the studio we can transfer the drawing one day, do a full-value color underpainting the next day, and on another day we can oil up the canvas and begin applying the final coat of color—in several painting sessions if need be. A process that takes two or three days in the studio is compressed into two or three hours in the field . 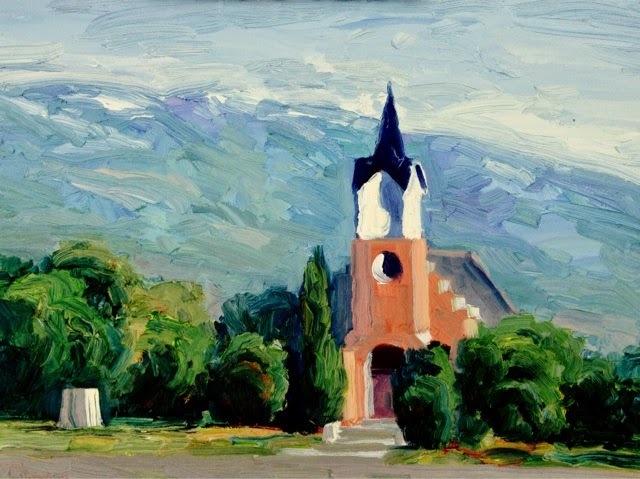 It is the compression of time that causes difficulty for plein air painters. The best solution is to break the plein air process into steps. There is no reason not to do a sketch one day, an underpainting the next, adding the final coat of paint on the third day (provided the light is consistent). Once this more lengthy process is mastered the painter can begin compressing a few steps into one. For example a painter might do a preliminary sketch, a thumbnail, and transfer the drawing onto the canvas in one session. The following day the painter might paint an underpainting and on the third day add the final coat of paint. Some might object that this unduly lengthens the process. But if all else fails this is the most reliable method to begin painting quality outdoor paintings. It's important to practise getting quality results. Floundering in the field painting one bad painting after another is not the best way to learn how to paint well. I've heard it said that one needs to get mileage on the brush. But it is best to practice painting well—no matter how long it takes—rather than practice painting badly. Brad, true words. I coach basketball and I always tell the kids, practice does not make perfect. Perfect practice makes perfect. Vince Lombardy is one of the few coaches I can quote. That's a good painting, Brad. You've got a nice capture of sunlight going on, interesting brushwork/texture, and a good composition. Well done! Thanks Bob. Was going to try a time lapse on this one but forgot to download the app before I left the studio! I have found that at least one day of pre-painting work is necessary to avoid floundering in the field on painting day. It's of course depends on the individual. But for me it takes two or three hours just to zero in on the motif, which requires a lot of walking around, looking through some sort of view finder and locating the exact spot from which to begin the painting the following day. I don't even take my easel or paint supplies with me on the initial scouting excursion because I know that I wouldn't get to the painting stage before the day is half over. I can forego the sketch but I can't eliminate the searching & composing day and expect to launch into the actual painting with a sense of knowing what I'm going to do. I can flounder and flail and hope for some serendipitous result without preparation, but most of the time I regret starting off like that. For me, plein air painting is a bit like being a movie director; first find a spot, then figure out where to set up and what to capture, and finally begin shooting the picture. I really should take two or three days to do all this but am too impatient and condense it all into one day. I think the day will come though when I don't care about all this stuff and will just grab my gear and go, without knowing where I'm going or what I will paint. I will make all these pre-decisions on the spot and start painting. I'm looking forward to that time. Good ideas Steve. There is no reason to think you have to do a plein air painting in one session. I have done a sketch one day, a color under painting the next, and the final painting on the third day. Works great. Sometimes slowing the process down is the right approach.